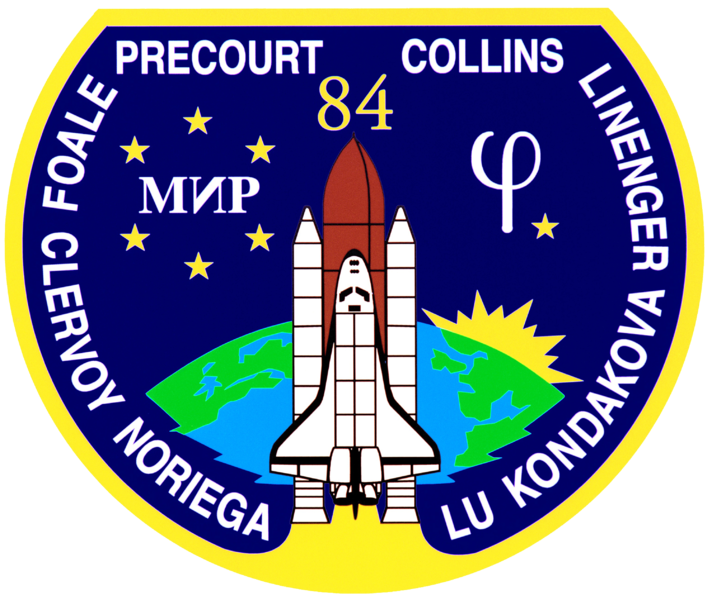 The STS-84 emblem depicts the Space Shuttle Atlantis launching into Earth orbit to join the Russian Space Station Mir as part of Phase One (Shuttle-Mir) of the International Space Station program. The names of the eight astronauts who flew onboard Atlantis, including the two who changed their positions onboard Mir for a long duration flight, are shown along the border of the patch. The STS-84/Mir-23 team will transfer 7,000 pounds of experiments, Station hardware, food and clothing to and from Mir during the five-day period of docking. The Phase One program is represented by the rising Sun and by the Greek letter Phi followed by one star. This sixth Shuttle-Mir docking mission is symbolized by the six stars surrounding the word Mir in Cyrillic characters. Combined, the seven stars symbolize the current configuration of Mir, composed of six modules launched by the Russians and one module brought up by Atlantis on a previous docking flight.